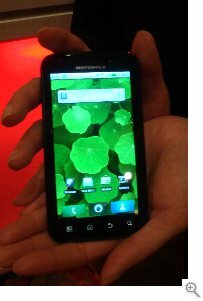 MOTOROLA ATRIX 4G smartphone with Android 2.2, 4G, Apps, Wi-Fi, NVIDIA Tegra graphics, 5 megapixel camera, and QHD display. The Atrix 4G starts off with a tablet shape dominated by a 4-inch, qHD (960 x 540) touchscreen. It is going to have an 11-inch display and a full keyboard and trackpad. 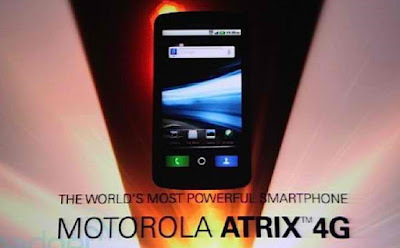 A large battery will provide power for the screen and to recharge the Atrix 4G. The Webtop app essentially turns the Atrix 4G into a full blown PC, complete with windowed UI, an Mac OS X-like application dock, a full version of Firefox with Flash 10.1 support, a file manager, and Citrix remote desktop support (shown connected to a PC running Windows XP full screen).